It’s been a while since I have done a Shocking Saturday, so what better way to return than with a cult classic. 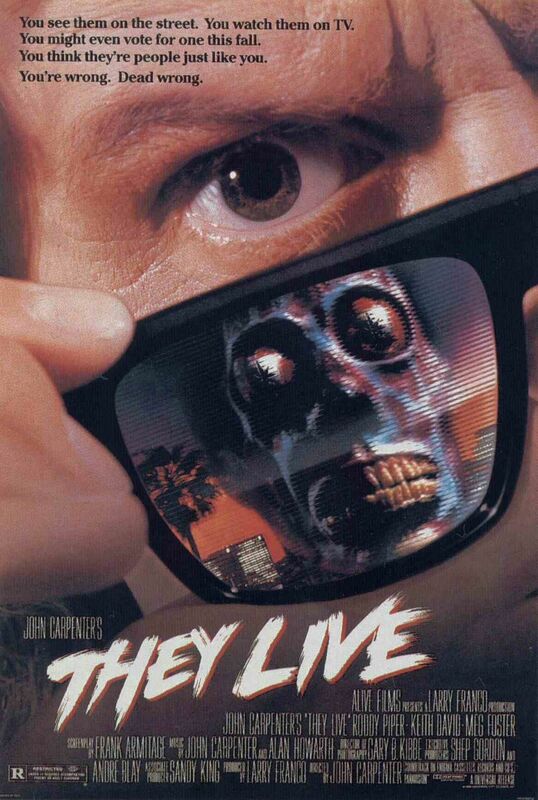 This week it’s John Carpenter’s sci-fi horror film ‘They Live’. It is a film that draws you in with its laughable 80s action movie acting, fight scenes and hairstyles, but keeps you gripped with a thought-provoking underlining story that will leave you questioning the world you live in. The film starts off by following Nada (Roddy Piper), an unemployed over-the-top muscle-bound man who is looking for a job in the city. After he gets a job on a construction site, Frank (Keith David), a fellow worker, leads him to a part of the city that offers food and shelter for homeless people. Now that Nada has got a job and sort of a place to stay it seems that he might be able to start a life for himself. However, after television sets begin to pick up a man raving about hidden signals, and Nada stumbles across a giant storage room where there should be a church, it appears that this little homeless community is planning for something big. At night riot police and bulldozers destroy the settlement, and any evidence that was it was ever there is lost, but Nada finds a box that they missed, a box full of glasses that when worn show the world for what it really is…a massive organisation based on consumerism. Nada finds it his goal to get to the bottom of this, and take out anyone who gets in his way. The acting throughout the film is questionable at best, however what it lacks in acting the film makes up for ridiculous fight scenes; one of which goes on for almost 10 minutes. After all this is an 80s film, and a very typical one; filled with cheesy one-liners and glam-rock hair. But in a way that is what makes it so good, it is sort of a nostalgic film that offers what we see in most films from that period, don’t let that put you off though because the actual plot is quite original. What first drew me in the watching They Live was that it was directed by John Carpenter, one of the great horror directors who has been scaring people since he released Halloween in 1978. Carpenter has some great films under his belt, such as The Thing and The Fog, and most know him for his horror films. However, like in They Live, he has delved in the sci-fi genre as well on many occasions with Escape From New York and Ghosts of Mars – with mixed results. Thankfully They Live is one that would be great in any John Carpenter fans collection, as, when viewing it, is so obviously one of his films. From the bass-lined score to the mysterious characters the film screams classic Carpenter. What I have found best about Carpenter’s films is the score, on the majority of his films he has created the music himself; sometimes with a little help from others, but he always has his say. It is easy to see how much effort has gone into creating it, as with Halloween and The Thing, the soundtrack was one of the aspects that defined those movies and brought that level of creepiness to the screen. Although They Live is not a horror, the funky bass that carries the film along is one of the prime things that keeps you watching as it usually sets the tone for the scene to come. Although you may let out a chuckle when the sound goes from silence to the bass line, it by no means takes away the enjoyment of the film; if anything it adds more to it. They live is a great 80s movie and a great John Carpenter film that deviates slightly from his usual genre, it will leave you wondering and laughing. Tag Line: You see them on the street. You watch them on TV. You might even vote for one this fall. You think they’re people just like you. You’re wrong. Dead wrong. Any gaming and horror fans out there will most likely have heard about, seen or played the 2013 infectious – literally – survival video game ‘The Last of Us’. Right from the mournful beginning to the unexpected end, the game kept players gripped to their screens as they attempted to survive in a world that has been overrun with an infection which turns people into killing machines. The Last of Us offered a lot more than just going around and shooting zombies though, it made the player use skills such as stealth to try to get past, but generally kill, the infected; and on occasions humans. You got to play as Joel – voiced by Troy Baker – whose main goal was protecting Ellie – voiced by Ashley Johnson – a 14 girl who just might be the answer to curing the disease. However as we know with these games, it is never going to be a walk in the park. 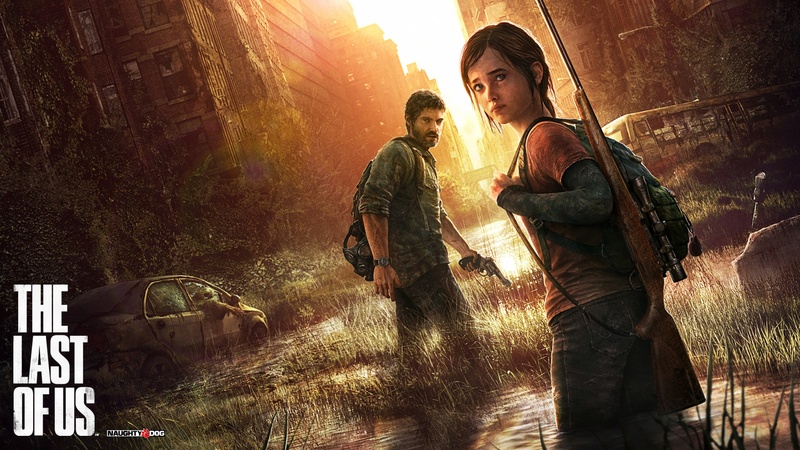 Well fans out there will be pleased to hear that plans have been set in motion to create a The Last of Us film. I for one am very excited about this because I think, if they stick to the storyline, it could offer something completely different to what has been seen in the zombie genre in the past years. Although I do love zombie films, at the moment they have been done to death, and are getting slightly repetitive. Not much is known as of yet about the motion-picture, only that the game’s creative director Neil Druckmann will be writing the script, Screen Gems will be distributing it and the great Sam Raimi (director of the Evil Dead trilogy) is attached to the project. With The Walking Dead taking the undead reins on TV, we need them to be taken once more for film. All you horror fans out there might have heard recently that Rob Zombie will be making his return to the horror genre very soon, with an – at the moment – unnamed film. To me this was quite an odd statement to make, mainly because I never thought he had left the genre; as his film ‘The Lords of Salem’ only came out two years ago. That being said the director has the horror fan-base in quite a stir for what he has in store for us next. Zombie’s directorial career has had some incredible highs, but also a few lows. His début 2003 film ‘The House of 1000 Corpses’, and its sequel ‘ The Devil’s Rejects’ were definitely the high points; they were so enjoyable and grotesque at the same time. However his remakes of the first two ‘Halloween’ films were not so great, it wasn’t that they were bad horror films it was that he added so much and also took so much away, that they were nothing like the originals. He really didn’t do justice to John Carpenter’s masterpiece’s. But enough of the past talk though, here is the new big news. Although we don’t know what film Zombie will be working on next, we do know that he is working on a TV series about one of the most notorious serial killers of all time – Charles Manson. The other big news is that he is going to be working on the series with the author of ‘American Psycho’ – the book about a man who works on wall street and in his spare time murders, mutilates, tortures and sometimes devours his friends and colleagues – ‘Bret Easton Ellis’. At the moment not much is known about the show, only that it will follow Manson and his gang as they committed some of the most violent crimes in history. It is said that the viewpoints will change, so it is likely that we will see the point-of-view of the victims at some stages as well. It will be interesting to see how this horror pair show what they want in the series, but at the same time show sympathy towards the people who were killed; one being Sharon Tate, the actress and pregnant wife of acclaimed director Roman Polanski. 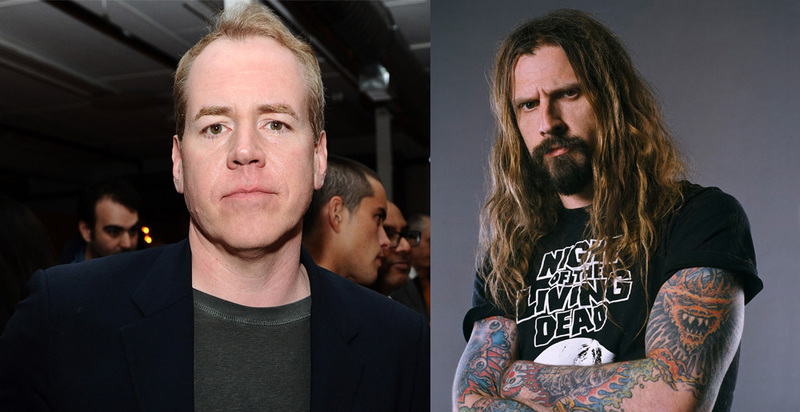 It sounds like it will be a great return for Rob Zombie.